Here is Viledon’s MV95, a MERV16 V-Bank with an initial resistance of only .31 w.g. ! Viledon offers its MV line in a variety of stock sizes, MERV ratings, and filter medias including their Hybrid Synthetic Nano Fiber. Commercial Filter Sales is the exclusive distributor of Viledon products in Washington and Oregon. The Viledon MV Extended Surface Filter meets all requirements of standard air handling systems as to frame dimensions, depth, and filter performance. Viledon’s filtration superiority is known as the viledon difference. – Viledon filters have been developed specifically for intake, exhaust, and recirculated air filtration HVAC systems that have stringent requirements for clean air quality and cost efficiency. 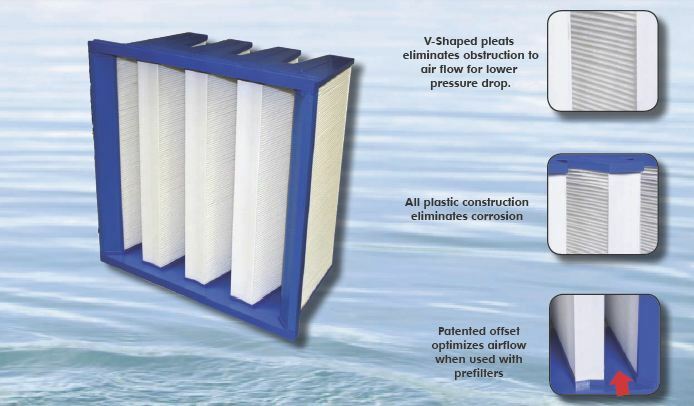 – Patented 1” recess design for “V” style filters drastically lowers pressure drop when used in conjunction with pleated or panel style pre-filters on the face of the filter. The patented 1” recess provides full utilization of the entire prefilter media area. – The MV95 V-Banks are potted into a high strength all plastic frame. This assures the user of maximum operational dependability and consistent filtration throughout each specific application. – The sturdy construction assures optimum performance under turbulent flow conditions and load changes. This means that the risk of particle or fiber shedding is practically eliminated. – Viledon develops and manufactures its own organic synthetic filter media. – Fine, progressively structured, thermally bonded media provide exceptionally low pressure drop at high efficiency levels. – Media is resistant to physical damage from moisture and chemicals. – The light weight of the MV provides easy handling and reduced cost for transport, shipping and disposal. – The entire filter element is free of metals, halogens, and glass fibers. The filter element is also corrosion proof and fully incinerable. These features allow for lower disposal costs. – Moisture-resistant up to 100% relative humidity. – Temperature Resistance: Continuous 160°F, Peaks 175°F.